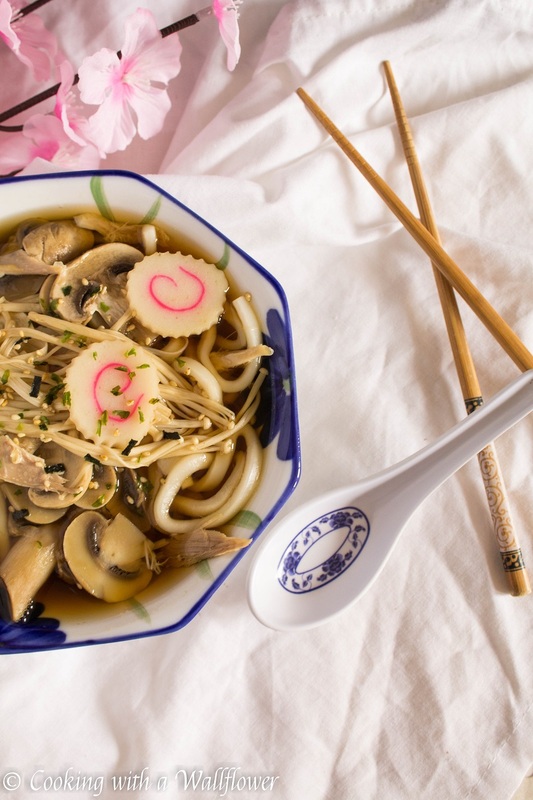 Udon cooked with chicken, fish cake, and mushrooms in a light broth. 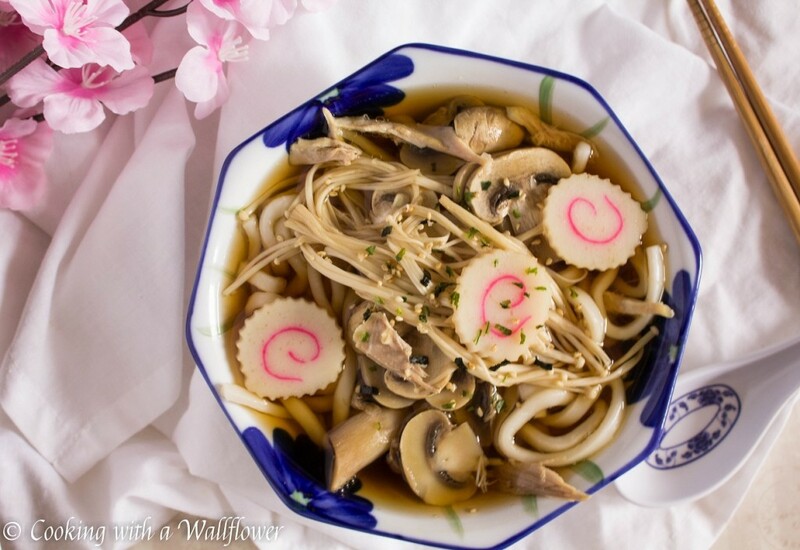 This delicious chicken udon soup is simple to make and tastes as good as the udon in restaurants. Happy Sunday! You have no idea how relieved I am to finally reach Sunday. A six day work week as a dental hygienist by day and a food blogger by night with just 3-4 hours of sleep was starting to take its toll. I finally get to sleep in! Yay! And since I usually can’t sleep in, I read celebrity gossip (or royalty gossip!) on my ipad. I know, the things I do with my time. But! Were you anticipating the arrival of the Princess of Cambridge? I know I was. Not the “checking every minute” type, but I was curious. I mean, it’s like watching a modern fairy tale. What’s not to be excited about? I live all the way on the West coast of the United States, but hey, it’s still fun to see all the excitement and celebrations across the sea through news and photos. None of that has anything to do with my udon, so let’s talk food. Cold and cloudy, the skies look dreary. But that’s okay, because it gives me the perfect excuse to eat this udon. I can picture myself wrapped in a nice cozy sweater with a bowl of these noodles. 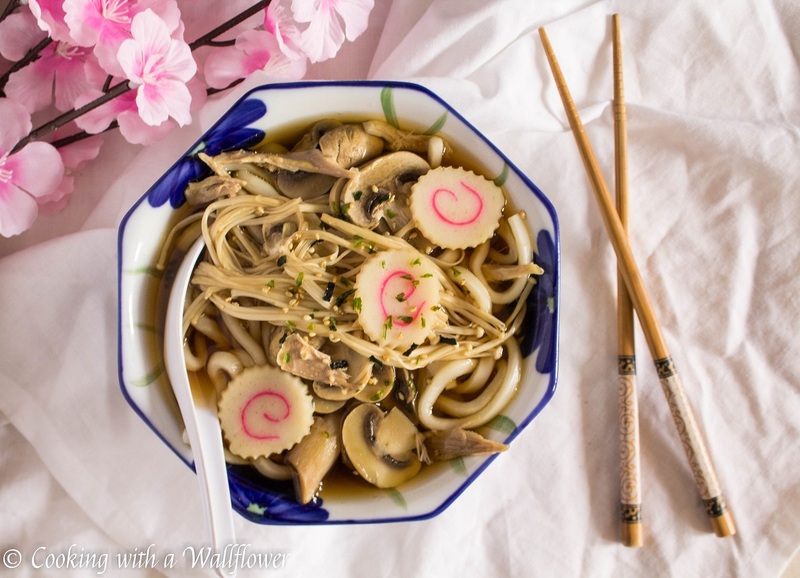 Each spoonful is warm and savory filled with chewy noodles, shredded chicken, colorful fish cake, and sliced mushrooms. I like to place my noodles on a large spoon, top it with more ingredients (In this case, mushrooms, chicken, and fish cake), and then dunk my spoon in the soup. That way as I slurp up the noodles, I get a tasty spoonful of pretty much everything. This dish is so flavorful yet so simple to make. You’ll want it for your next dinner. First, add the kombu dashi powder and water to a medium sized pot. Kombu is a kelp that gives this soup flavor. The package that I buy come in little individual packs, which is perfect since I only needed one to make this soup. Allow the kombu water mixture to boil before adding the soy sauce (or tamari), mirin (sweet cooking rice vinegar), and a little sugar. You can always add more to taste. Next, add the mushrooms and the fish cake to the pot to cook for a few minutes. When you’re about ready to serve, stir in the enoki mushrooms. 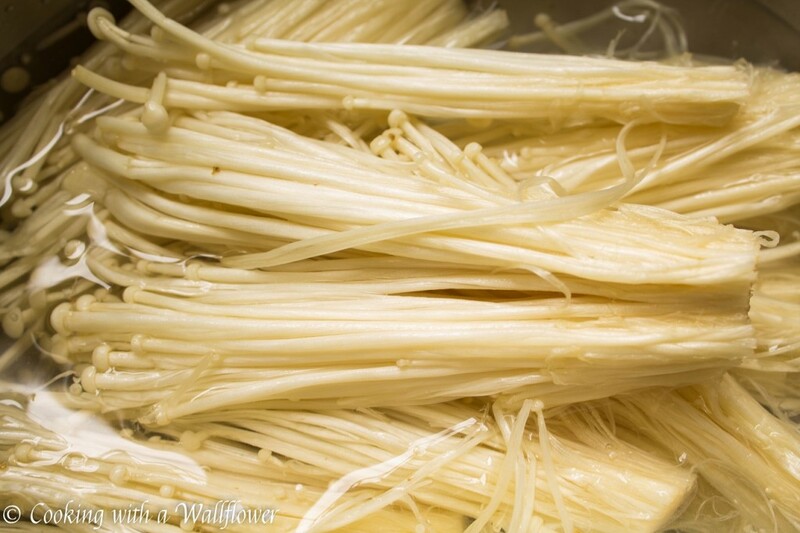 Enoki mushrooms are thin and cook fast so you want to add them at the end, that way you won’t overcook them. Meanwhile, in a separate pot, boil water and cook the udon. 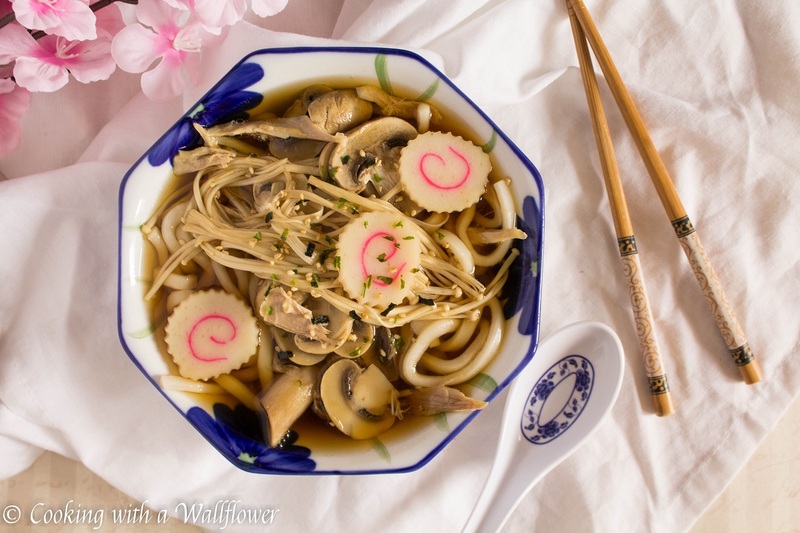 You can actually cook the udon in the soup, but I prefer to cook them separately. Why? Because I noticed that any time I cook noodles in the same pot as the soup, the soup becomes a murky color due to the starch coming out. For a clear broth, I cook my noodles separately, place the cooked noodles in a bowl, and then pour the hot soup over. Of course, you can always cook it in the same pot and make it a one pot dish. I also used instant udon, as in the packages that come with the seasoning similar to ramen. I threw out the seasoning and just used the udon. Once the udon finishes cooking, drain the noodles and place them in a bowl. Top with the shredded chicken. Then pour the hot broth on top. Garnish with cilantro or scallions. You can even season it with furikake rice seasoning. Join me and other food bloggers at Fiesta Friday! 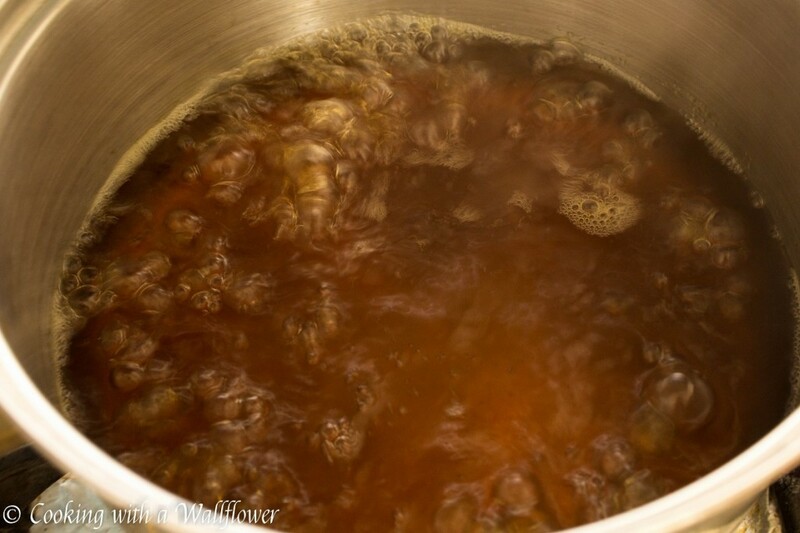 In a medium sized pot, add one package of the kombu dashi powder and water. Allow them to come to a boil before adding the soy sauce, mirin, and sugar. 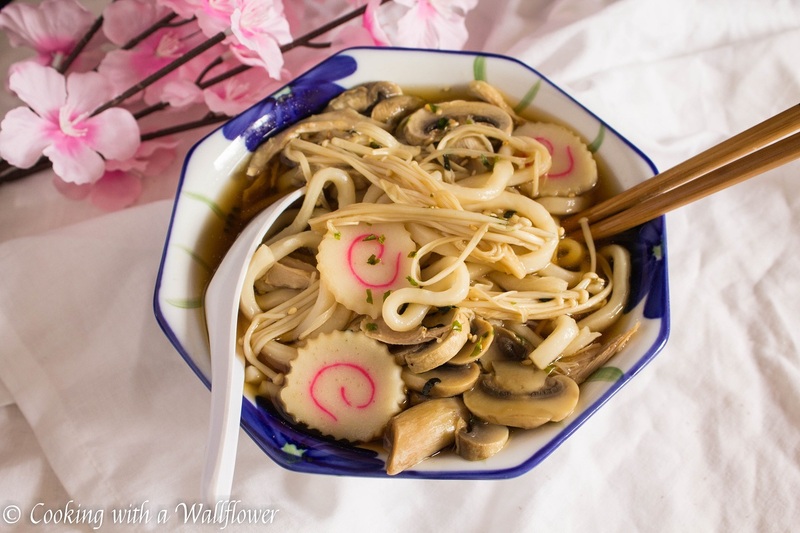 Once the broth is hot, you can add the sliced mushrooms and sliced fish cake. Once the broth is ready to be served, stir in the enoki mushrooms. In a separate pot, add udon to boiling water. Cook for about 2-3 minutes until the noodles are soft, or cook according to the label on the package. 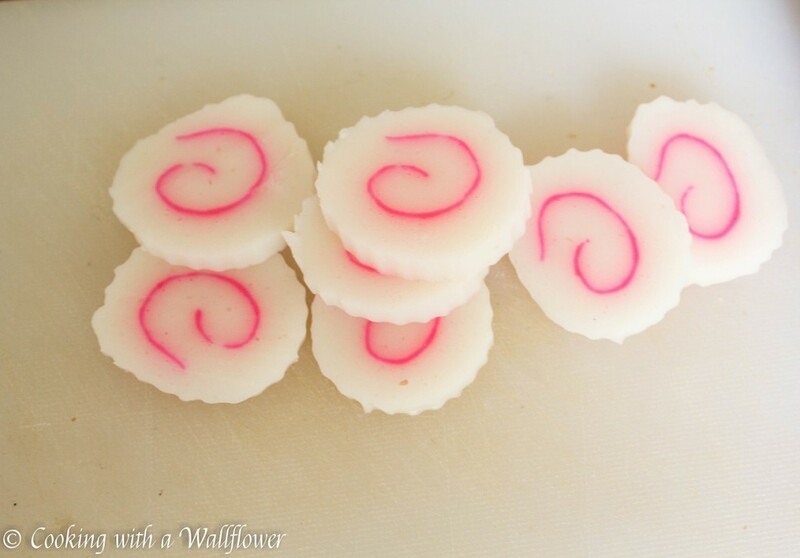 Once the noodles are cooked, drain them and transfer them into a bowl. Top the udon with the shredded chicken. Pour the broth over the chicken and noodle. Garnish the soup with scallions, cilantro, or furikake rice seasoning. Or all three! Serve the chicken udon soup warm. This entry was posted in Asian Inspired, Entree, Quick and Easy, Recipes, Soup and tagged Asian inspired, quick and easy, recipe, soup.